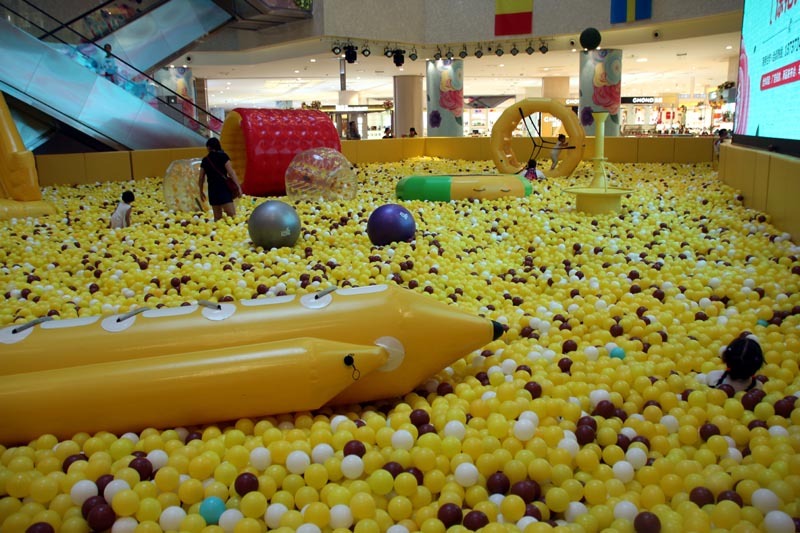 Bubugao Plaza celebrated Children’s Day by building this large pit and filling it with thousands of plastic balls. Rather idiotically, they sited it right beside the main entrance to the shopping mall, effectively blocking entrance to their over-priced, under-populated stores. It took them about a week to work out why the place was even more empty than usual. They have now moved the ball park inside the building and into the large empty space on the first floor. Now everyone can get into the place. Not that many want to. I’m still mystified as to how the place exists. Apart from the restaurants on the top two floors and the supermarket and cheap noodle joints in the basement, every retail outlet appears utterly devoid of customers. I’ve visited at all hours of the day and it’s always the same. A week has passed and they have moved the damn thing back outside to block the entrance again! I guess they don’t know what they are doing.
. This entry was posted on Tuesday, June 14th, 2016 at 11:47 am	and is filed under Restaurants, Stupidity, Supermarkets, Updates. You can follow any responses to this entry through the RSS 2.0 feed. Both comments and pings are currently closed. Why are you always so negative? Why are you always so stupid?